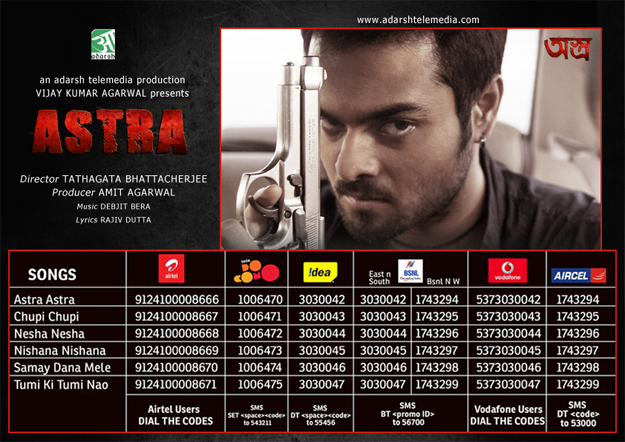 Astra is a tale of a gangster who becomes a victim of love. Baban, orphaned at a young age and brought up by Mansoor Ahmed and Fatima Bibi, becomes a dreaded sharp shooter, as willed by destiny, working for underwold don Faiz Alam and executing contracts given by Biplab Dasgupta, a corrupt political leader. In a strange twist of fate he gets to meet Koena, a journalist with guts. They fall in love eventually. Koena who was unaware of Baban’s identity at first later becomes an eye witness to one of his contract killings. Love gets a jolt. Baban unfolds his story to Koena who asks him to come out of the mess. Baban agrees to do so much with the support of his do-gooder friend Sambhu but the one way traffic rule of the underworld finds him at the wrong end of the stick as plans to dump him are set. Though Baban after much blood and gore wipes out his enemies he too lands up getting killed by foul play. At the end of it all it is but tears for those who are left behind as crime never pays. The film was appreciated both critically and by the masses. The film was released on a large scale all over Bengal. Leaving a success mark on Bengal’s Box office, the film celebrated a golden 50 days and finally ran for more than 70 days on its first release. WINNER of Best Producer (Debut) Award in the 22nd Kalakar Awards (Kolkata, India). Playback: Rupam Islam, Chandrayee Bhattacherjee, Manisha, Sujoy Bhowmik, Nayan Bhattacherjee & Debjit Bera.